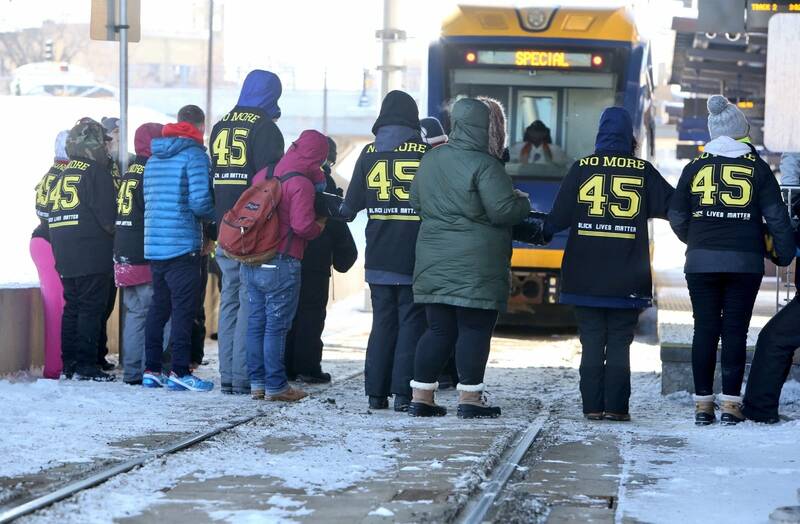 Police removed 17 protesters after a group blocked Metro Transit light rail trains on the Green Line near the University of Minnesota's West Bank for about an hour Sunday afternoon. Metro Transit officers removed, but did not arrest the protesters, said transit spokesman Howie Padilla. They were cited with unlawful interference with transit, Padilla said. All protesters appeared to be adults. Both eastbound and westbound lands were cleared by 4:15 p.m. No one was injured. Padilla said representatives from the American Civil Liberties Union were at the scene and helped officers facilitate the removals. Protesters stood on the tracks, just a short distance east of U.S. Bank Stadium in downtown Minneapolis. About 100 protesters, who said they were representing a group called Black Visions Collective, wore T-shirts that read "You Can't Play With Black Lives." They chanted: "Black Lives, they matter here." The group called on the Minneapolis Police Department to stop hiring officers and repeatedly chanted the names of people killed in high-profile police-involved shootings in the last several years. Police officers had begun to show up by about 3:15 p.m. at the rail station. Security officials said about 100 passengers remained on the train. The rail station is closed to regular traffic, as the trains shuttled Super Bowl fans to the game. 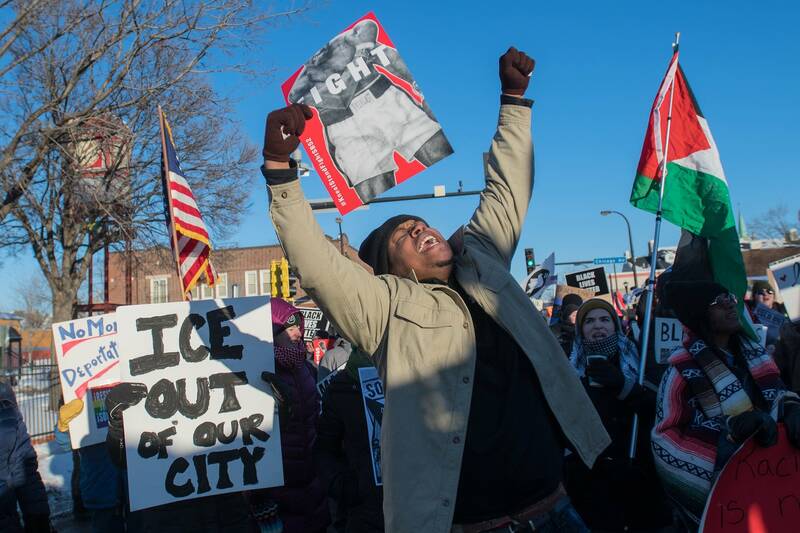 A separate planned protest and rally was underway at Chicago and Franklin avenues. 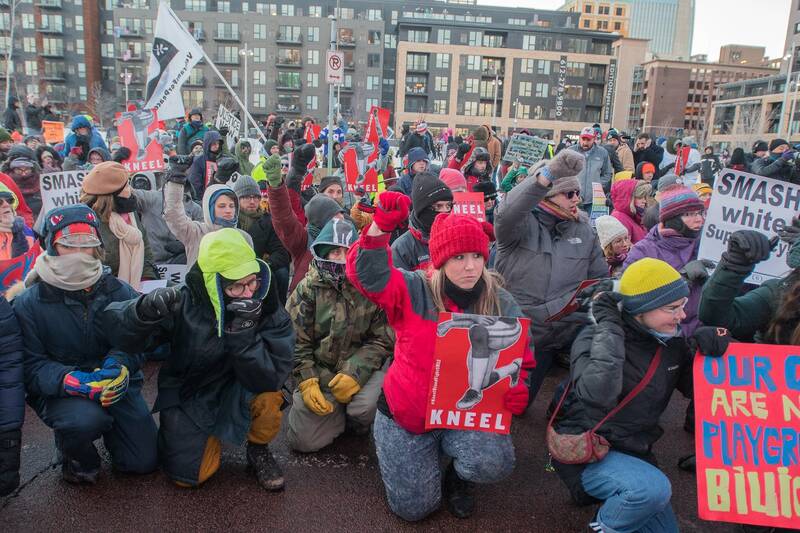 More than 100 protesters marched into downtown Minneapolis just before the Super Bowl started Sunday evening, blocking traffic and temporarily impeding one of the entrances to U.S. Bank Stadium. 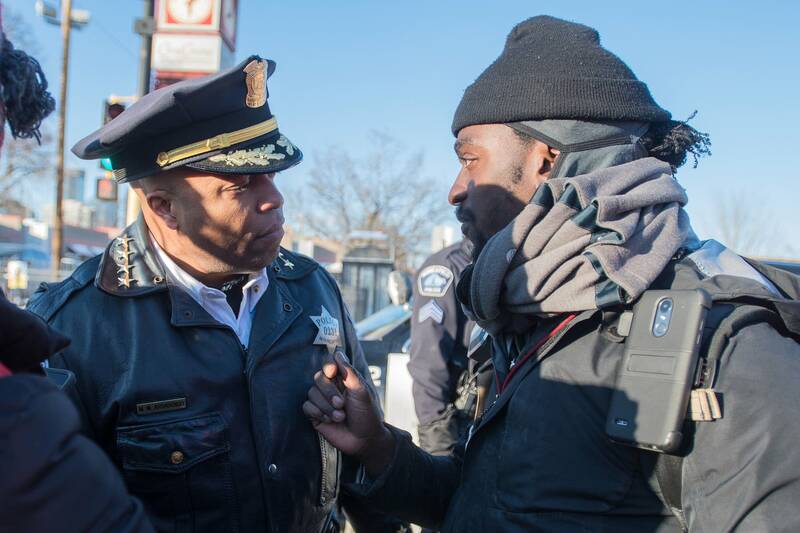 Minneapolis Police Chief Medaria Arradondo met the protest groups where they first met, at Chicago Avenue and Franklin Avenue, delivering boxes of hand warmers. "We've been preparing for a couple of years for Super Bowl LII to be here in Minneapolis, but as chief I'm certainly aware there are concerns that our community has had for a long time and will still have long after the Super Bowl leaves in a few hours," he said. "So it's important for me to be out here to listen to those concerns and see what I can do to make sure folks have the opportunity to have their first amendment rights protected." Protesters marched into downtown, and just before game time, they crowded around entry number three at the stadium, and kneeled down. "Everyone, we are taking a knee to support Colin Kaepernick's stand for racial injustice across the country," one of the organizers said before the protesters knelt. Kaepernick is the former NFL quarterback who began taking a knee before games to protest racial injustice. The protest ended after about a half hour.